I am required to drive about fifty Km. to work and back daily. It is mostly on highway. Resultant stress not just drains my energy, it makes me feel hopeless. Most accident that I see on the road, I feel, could be avoided with little more respect for life. One question always arise in my mind – what can I do about this? One thing is obvious that some care and efforts on part of authorities as well people using road can make life on roads much easier and safer. Many measures do not require much money. 1) Driving skill, attitude towards safety and awareness level of drivers are very important. Good roads are of no help if driver is bad. Drivers should be well trained and tested. Can we think of one more independent agency testing driver, before issue of the licence? After all it is a question of safety of many. 2) Very old vehicles on road often create problems due to breakdown. All vehicles after ten years should pass through minimum safety requirements every year. 3) Overloaded vehicles and vehicles with long items coming out are dangerous for others on the road. Strict action must be taken by RTO. Two pictures given here are taken while travelling on NH. no. 3. Truck in front was carrying long rolled products coming out from rear end. It could be seen only when car came closer (picture no. 2). 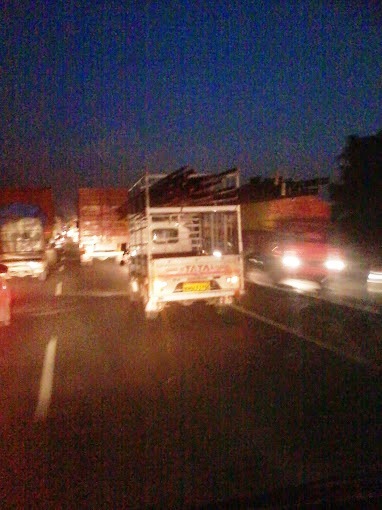 Traffic was moving at the speed of about 70km. per hour. This is a situation on road that must be avoided at any cost. It is full of potentiality of fetal accident. 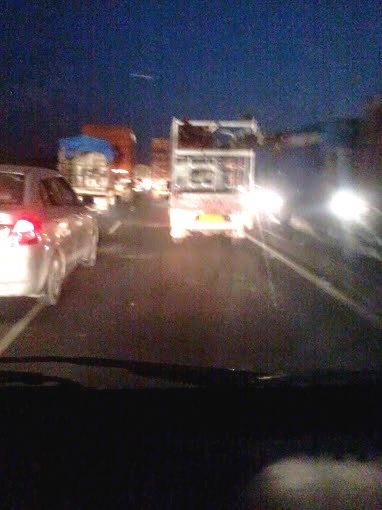 4) Most trucks and three wheeler do not have proper clean rear reflectors and glowing strips. They are very hazardous. It hardly cost any money. Used CD can also serve as a good reflector. 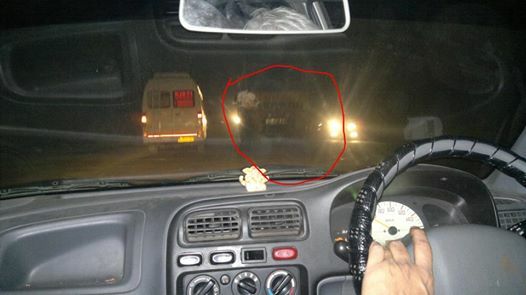 Can you see a truck in front in the picture given under? Strict action should be taken against such offenders. 5) Speed limits should be strictly enforced. Normal speed meets every need, doesn’t it? 6) Now let us talk about roads. *Roads should be properly lit. *Lanes should be marked. Lane discipline needs to be taught and reinforced in driving school and during driving test. *Speed breakers should be as per standard size and well marked with glowing paints. *Beginning and end of road dividers should be having sign with glowing paint or LED lights. *There should be one particular officer accountable for a specified stretch of road. People should be able to email pictures and suggestions to him for problems faced on that portion of road. Accountability should be fixed. 7) Points discussed above will serve no purpose if we are not responsible towards safety and convenience of others using road also. Courteous attitude on road reduce level of stress in self and others leading to safer travel. Let us make our roads safe and pleasant to use. I will end saying that safety is not just insurance, it is a prayer. Above article is written for Nissan Safety Driving Forum contest. Please visit link given under. The Nissan Safety Driving Forum.